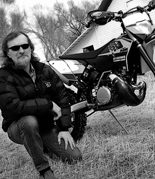 Gear up your Adventure motorcycle! Take your bike out for a spin with safety assurance, thanks to Slavens Racing dual sport riding gear & parts. Minimize accidents and injuries by preparing your bike with exceptional motorcycle accessories and get riding gear that protects your person. From helmets and backpacks to mirrors and hydration bladders, we’ve got everything you need and more! 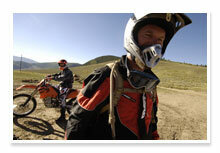 Check out our wide selection of Slavens Racing Adventure travel gear and get riding today! If your adventure brings you through the Colorado Springs area, stop by our showroom and warehouse Mondays through Fridays from 9:00am to 5:30pm MST, or call us at 719-475-2624 and we will be happy to answer any questions you may have.